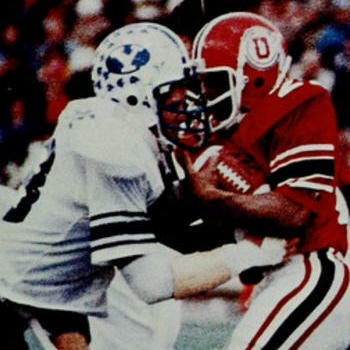 Utah players and fans alike were not certain if the squad had turned a corner but the improvement to 8-3 in 1978 with victories over rivals BYU and Utah State were welcome relief from the misery of recent past seasons. A mix of JC transfers, freshmen, and veteran holdovers made for scrappy football. While punter Rick Partridge was again All Conference before proceeding to a pro career that would take him from the Saints, to Chargers, into the USFL and finally end as a replacement player with the Bills in �, positional players were also noted, unlike the previous season. The ground game was solid behind the 803 yards generated by Tony Lindsay and 566 more tallied by Robbie Richeson and returned-from-injury captain Mike Moseley. Randy Gomez exceeded his fine � performance, passing for 2027 yards and nineteen touchdowns with Frank Henry pulling in forty-five for 771 yards while leading the WAC in touchdown receptions. Gomez, whose best sport was baseball, later made it to the MLB with the Giants. Both defensive back Jeff Griffin who tied an NCAA record with three interception returns for touchdowns, and tackle Jeff Lyall led the defense. Lyall who followed Coach Howard from Long Beach state recorded 107 tackles and earned All Conference recognition. Also honored was offensive guard Tom Krebs who had a solid CFL career before entering the real estate business. 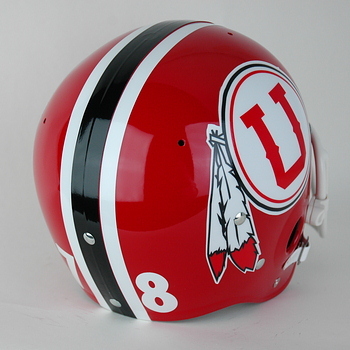 Howard tweaked the helmet design to one the Utes would maintain for some time, changing to a one-inch black center stripe flanked by half inch white stripes, while maintaining the white mask and distinctive circular Utah decal with trailing feather. Coach Howard returned to the practice of placing award helmets on the shell, using white tomahawk shaped decals. Fans were a bit disappointed seeing the 6-6 mark of � with losses to both Utah State and BYU as a step backwards. However much could be blamed on injuries as Coach Howard noted, 揟hey were dropping like mad!� Sprint out quarterback Floyd Hodge held up and passed for over 1000 yards, 560 of those to receiver Jim Teahan with solid play from tight end Steve Folsom. The ground attack was again handled by Tony Lindsay and his 816 yards and fullback Roderick 揇el� Williams. Lewis Walker was a pleasant surprise adding 714 yards and showing terrific return ability, joining Lindsay with All Conference honors. Wayne Jones and Dean Miraldi handled things up front while Steve Clark did the same on the defensive line. Linebacker Bill Gompf came up with six interceptions and Jeff Griffin抯 three sealed All WAC honors for him. Howard抯 offense was solid in 1980 with over 420 total yards per game, big numbers for the era, even in a conference with BYU. It put the Utes in the nation抯 top ten. The defense was often hit-or-miss and one of the two fifty-plus point collapses was against BYU who reinserted starting quarterback Marc Wilson to secure a record-setting day in the game抯 waning moments. The 56-6 loss was the worst in the rivalry series and peaked Coach Howard抯 ire. Ricky Hardin did well with the souped-up offense, throwing for 2458 yards, often to Jim Teahan who became the school抯 all-time leading receiver, and Floyd Hodge. Tehan later played minor league baseball before entering the medical field. Tight end Folsom, another Long Beach State player who had followed Howard to Utah and served as a back-up on the Utah basketball team that went to the NCAA playoffs, was drafted by the Dolphins but signed with the Eagles after being cut in camp, played there and with the Giants through �, was with the Stars of the USFL for three years, and then returned for four more with the Cowboys to close out his pro career. The ground game was solid, again led by 揚opcorn� Del Rodgers and Tony Lindsay. The Lindsay family, through a number of decades has very much been football royalty in Denver. Tony finished his Utah career with 2995 rushing yards, became a successful high school coach after spending time in the CFL with Toronto, and both he and his brother Troy, a former Colorado State star, had six sons who played collegiate football at a very high level. The inconsistent defense placed linemen Dean Miraldi and former Parade High School All American Steve Clark on the All WAC team. Miraldi played offensive guard in a seven year NFL career that began as a second round draft choice of the Eagles, and finished with stints in Denver and at the Raiders. Jeff Griffin again stood out in the secondary, earning a second season of All Conference honors and going to the Cardinals as their third round draft pick. He had five seasons with them and finished in � with the Eagles. A rebound year in 1981 to a solid 8-2-1 mark made it appear as if Utah had turned the corner and Howard抯 program was on solid footing, completely recovering from the Lovat years. Three shut-outs and a 7-7 tie with New Mexico reflected well on the defense despite a 56-28 loss to BYU. Although quarterback sacks were not yet kept as an official statistic, the � team is often credited with a whopping seventy-seven. Offensive Coordinator and future Utes head coach Ron McBride ran a high powered offense with quarterback Tony Graham running the show with 1426 passing yards and once again Del Rodgers was the solid ground gainer. The school抯 first 1000 yard rusher, he took his All WAC accolades to the Packers and Niners in a seven year pro career. He later became a respected sportscaster in the Sacramento area. The Utes highly rated 240 rush yards per game came behind an offensive line led by All Conference performers Jack Campbell and Wayne Jones with Darryl Haley a number two draft pick of the Patriots. Haley graduated high school at fifteen and after playing seven NFL seasons for three teams, has had an eclectic post-football career, serving as a corporate fitness trainer, directing a music therapy program, and owning a bed and breakfast. Campbell, a USC transfer, spent 1982 with the Seahawks while Jones was a three year member of the USFL Express before finishing his career with the Vikings. 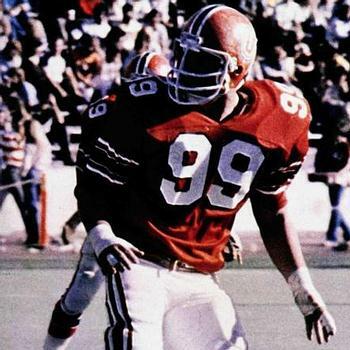 The improved defense featured Dolphins draft choice and second-time All WAC defensive end Steve Clark who occasionally played both ways for Miami and linebacker Bill Gompf, another All Conference pick who finished the season with 128 tackles and then played with the USFL Breakers. In a somewhat shocking and baffling turn of events, when the season was over, for no apparent reason, Head Coach Wayne Howard walked away from Utah. Some thought he was frustrated that Utah did not have enough national presence to get bowl consideration when successful or was a bit disgusted by the overzealous religious aspects of the rivalry with BYU. Some attributed it to a new pop-psychology term, 揵urn out,� noting that Howard had collapsed on the sideline in 1980抯 game against Wyoming and suffered headaches for a number of months afterwards. Many years later however Howard stated, 揟here抯 really no story. It wasn抰 that I was really unhappy or they were unhappy with me. I wanted to get back into California and I wanted to try some new things and no, I can抰 think of any particular thing that made me leave.� Some thought he would get the head job at Cal that instead went to Joe Kapp but after two years of coaching at Long Beach City College Howard successfully went into private business and retired to South Carolina where he remained a fan of Utah. 1982 found Utah once again seeking a new head coach, Utah made what was thought to be a solid hire in Chuck Stobart. He was another member of what had become a highly respected group of men who had played and coached in the Mid America Conference in the 1950s. His lengthy list of accomplishments included a successful high school coaching career in Ohio, the development of passing phenomenon Greg Cook at Cincinnati, and serving as an assistant on Bo Schembechler抯 staffs at both Miami (Ohio) and Michigan. As Toledo抯 head coach he had most recently led the Rockets to a MAC Championship, California Bowl victory, and had two conference Coach Of The Year Awards to his credit. He was also a tough disciplinarian reflective of the 揃o influence.� Not unexpectedly Stobart emphasized the Power I offense and run game and senior Carl Monroe had a record-setting 1507 yard season placing him seventh in the nation. His added kick return skills made him All Conference and earned him five seasons with the Forty Niners. He unfortunately died of a drug overdose in 1989. Hilria Johnson added another 718 to the total ground game while quarterback Ken Vierra kept defenses honest with 1315 in the air. Thirty of those throws were caught by Tony Graham. Lonnie Lawson抯 four interceptions put him on the All WAC team also, while the Utes defense was tops in the conference behind linebacker Mark Blosch抯 172 total tackles. A lack of depth caused second half derailment of the � season in a number of games despite a potent total offensive production that finished eighth nationally. The result was a 5-6 mark. 1982抯 quarterback Ken Viera did not like Stobart抯 emphasis on running and transferred to Maryland, leaving the position open for Mark Stevens who finished twelfth in the NCAA抯 total offense tally. Eddie Lewis topped the rushers with 734 yards while ends Joe Tarver, who caught fifty-one passes, and Dan Huey who caught thirteen of his forty-one against Wyoming rounded out the attack. Tight end Andy Parker was a six year performer for the Rams and then had another season with the Raiders. All WAC defensive end Jeff Reyes finished his Utah career with another fourteen sacks with assistance from linebacker Mark Blosch抯 162 stops. 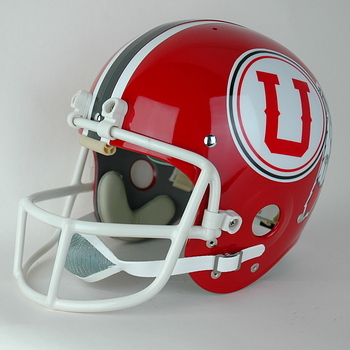 In 1984 the team抯 6-5-1 finish obscured the fact that the Utes played strong defense, displayed the nation抯 number six rushing attack, and the losses came via a total of only twenty-eight points. Stevens again directed the attack throwing for 1889 yards and running for 452 with transfer Danny Huey blossoming with fifty-two receptions and All Conference recognition. Eddie Johnson was an Honorable Mention All American as a freshman, posting 1021 yards with two 200+ yard games, limiting last season抯 bell cow Lewis to a mere 314yards although he had a huge seven yards per carry. Much of the rushing was done behind All Conference guard Carlton Walker. The tough defense too had representation on the All WAC squad with tackling machine linebacker Blosch, nose guard Peter Owens, DB and return man Erroll Tucker, and WAC Defensive Player Of The Year Filipo Mokofusi. Players and many fans were shocked that four days after their finale loss to BYU Stobart was no longer Utah抯 head coach. On November 21 it was announced that Stobart would be 搇ooking for a job with a contract, while the school has started a search for a new coach who will boost attendance.� The hard-nosed run game philosophy of Stobart had kept the program respectable but attendance had sagged and it appeared that the head coach and athletic department, as had been the procedure with previous head coaches, had operated on a handshake agreement that was no longer acceptable. A contract and extension were off the table so Stobart walked, immediately taking the offensive coordinator job at Pitt under Foge Fazio before moving on to Arizona and USC and again becoming a head coach, this time at Memphis State. After six seasons in Memphis, Stobart completed his career at Ohio State as offensive coordinator. AD Arnie Ferrin抯 statement summed up the situation thusly: 揥hat we have tried to do is give him the option to see if there's something out there that's really exciting to him and give me the option to see if I can find somebody that will put more people in my stands than have been in there the last two years.� It was also known that Stobart was not comfortable socially and would prefer to be on the field with his players, making it even more difficult to recruit against a BYU program that won the season抯 National Championship. In what seemed like an ongoing cycle, the Utes were again seeking a head coach. Taking the place of the socially stiff Stobart for 1985 was former Utah assistant Jim Fassel who was purposely sought for his wide-open passing approach to offense. A former quarterback at Fullerton JC, USC, and Long Beach State, his attempt at a pro career followed a similar wandering path with brief stops at Chicago and San Diego in the NFL, Toronto in the CFL, and finally with the World Football League Hawaiians. He is perhaps best known as a player for both serving as a Hawaiian assistant coach who was forced into the last game in their existence when the team抯 quarterbacks refused to play due to the long time absence of a paycheck [ see HELMET HUT http://www.helmethut.com/WFL/WFLHawaiians.html ]. He served as quarterback and receivers coach at Utah, Weber State, and struck gold while at Stanford in a number of capacities, given credit for helping to develop John Elway, 1979 through �. He was last with the USFL Breakers before being called to Salt Lake City to add excitement to the program. The Utes 405 offensive points and 8-4 mark did draw attention although they again lost to BYU. Quarterback Larry Egger put up 2988 passing yards, throwing often to wideout Loren Richey who caught seventy-three passes for 971 yards. Big runner Eddie Johnson had to take a back seat to leading rusher Eddie Lewis who topped 1000 yards behind All WAC guard Kevin Reach. Also on the All Conference team despite what the press described as "a defense that was non-existent at times,� was DB Erroll Tucker whose six interceptions and return ability were parlayed into a seven season pro career, one that could have been better and perhaps longer if not for a severe leg injury that cost him a great deal of playing time, that took him through three NFL teams, the World League Of American Football, and the Calgary Stampeders. Up front linebacker Filipo Mokofusi earned a training camp try with the Saints and his son was later an excellent Utah player. Whatever optimism that came with the � season disappeared quickly as 1986 progressed, noted by some to coincide with the loss of many of Stobart抯 former recruits. The high-powered offense was still ranked high at number eight but did less scoring with only 278 points and more importantly the defense allowed 444 to opponents as the nation抯 worst defensive team! 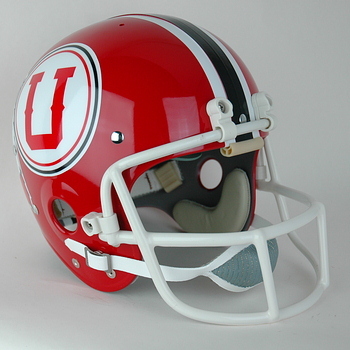 The 2-9 record plunged the Utes to the WAC basement although quarterback Egger threw for a national ranking 2761 yards, Eddie Johnson reinvented himself as both a receiver garnering 775 yards and the excellent runner he was earlier in his career to make All Conference with 1046 yards on the ground. All WAC tackle Dave Cullity did the grunt work with receiver Loren Richey turning in a terrific year on a WAC best sixty-seven receptions and earning a free agent shot with the Rams. By 1987 it appeared that Coach Fassel抯 pattern had been set: big offensive numbers and porous defense. Some followers more often said 揳bysmal defense.� After �抯 5-7 finish where the Utes were cited for 揵eing consistent at being inconsistent,� there was a lot of frustration. Terrific rusher Eddie Johnson went out early with a knee injury leaving the running attack to Martel Black. Chris Mendonca was the starting quarterback, putting up the usual big numbers at 2389 yards but freshman Scott Mitchell was impressive with 1448 himself. Carl Harry was on the receiving end of enough passes to total 826 receiving yards. The defense did not improve and ranked 104 of 104 teams although defensive back Eric Jacobsen did make the All Conference team on the strength of his seven interceptions.